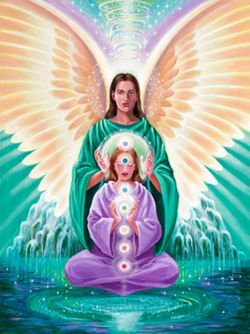 Archangel Raphael of the 5th Ray of Light (the Emerald Green Ray) assisting during a self healing meditation. He also works with you like this when you attend an Attunement With The Masters session. Consider calling on Archangel Raphael during your next meditation. He shows up with someone I know when he surfs. Surfing counts as meditation, right? It sure does, if you ask me. If you’d like to learn how to heal yourself during meditation and to work with the Angels and Beings of Light, please get in touch.